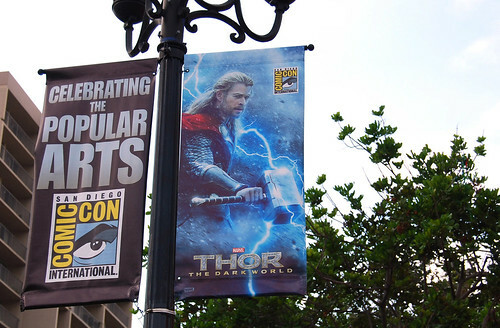 There was no defining moment or image to this year’s comic-con. There were no extraordinary costumes that I hadn’t seen before. 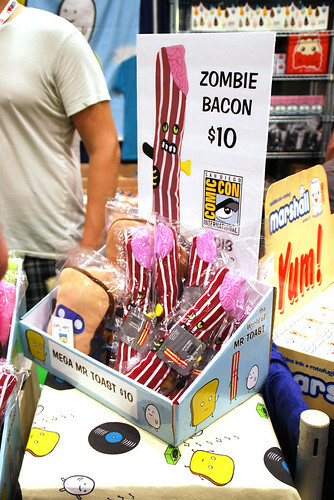 Many vendors had the same thing and even the theme of comic-con was a menagerie of different pop culture touchstones. In previous years I had seen zombies make a big play, Adventure Time was huge last year and steampunk made a big leap to mainstream somewhere in between. This year had all of that including the random sightings of Star Wars stormtroopers, uniformed Star Trek officers, Doctor Who and comic heroes. Frankly, this comic-con seemed like a rerun of previous conventions on constant replay for 5 days. Very enjoyable reruns but reruns nonetheless. The market this year seems to stocked with silicon ice trays. 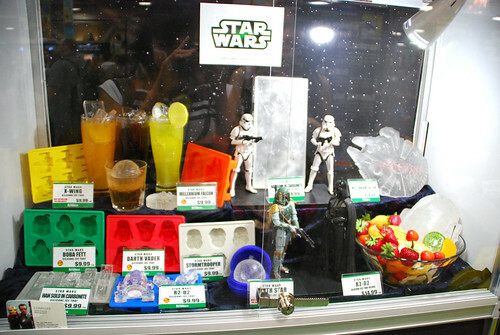 Kotobukiya originally broke the market a few years ago with their Star Wars line of ice trays and offered more this year with a Millennium Falcon and Death Star. 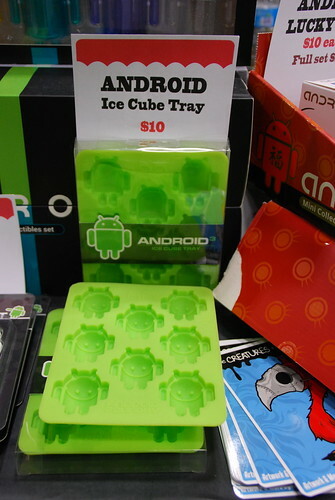 Other vendors had ice trays but with a different slant to it. 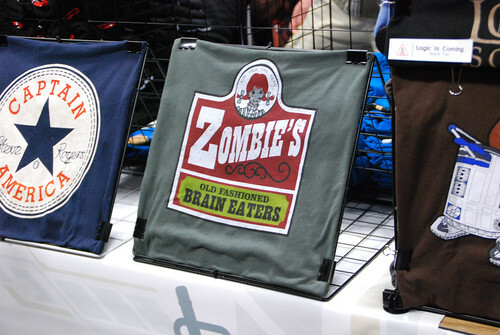 I did a double take on this shirt that swiped the Wendy’s logo and changed it to zombies. 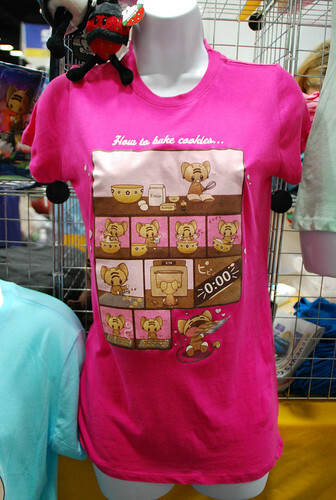 I was tempted to get this for Paul with the intention of wearing if we ever stepped into that fast food franchise. Aside from helping Paul man the Cool Jerk table, I planned to attend only two events. 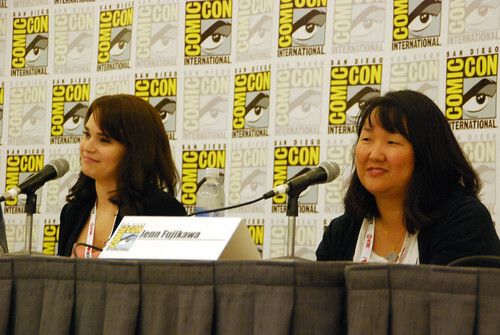 A Feast For Your Eyes: Creativity in Comics and Cuisine showcased bloggers Jenn Fujikawa (JustJenn Recipes/JustJenn Rants) and Rosanna Pansino (Nerdy Nummies), both two well-known geeks. Rounding out the panel were San Diegans Brian Malarkey (Seersucker) and Ignacio Cervantes (Pizza Port), and Justin Warner (Food Network Star winner) and C.B. Cebulski (Marvel Comics) from New York. It was an fun panel that showcased everyone’s insight into their creative process. Outside of the convention center, my friend Marc and I checked out the Godzilla Experience for the upcoming American-made Godzilla movie. 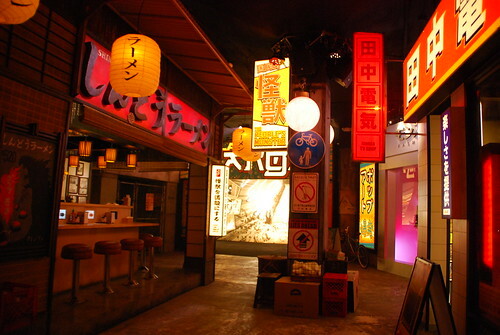 The interactive experience was located in a building on the corner of 7th Ave. and J St. Once we were ushered in, we found ourselves in downtown Tokyo but with a “Godzilla Really Exists!” vibe. 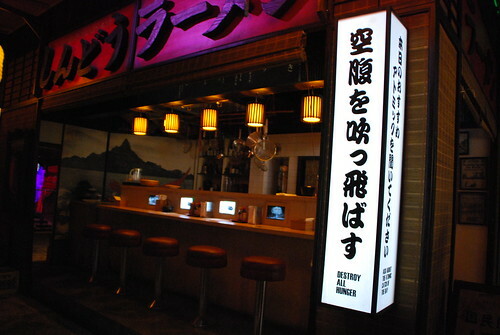 There was a ramen restaurant with Godzilla-themed menus and placemats and “Destroy All Hunger” on its signage. It was very much like a walk through Star Tours, ending on top of a 25th floor and Godzilla passing by, peering into the windows. Paul was envious when I showed him all the photos. Downtown was a flurry of activity. 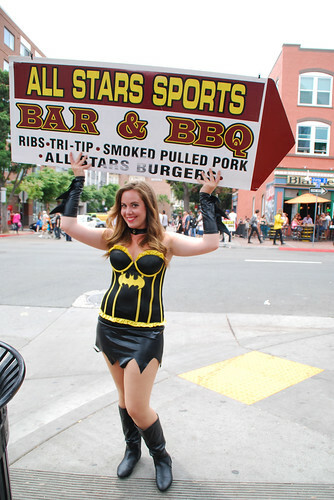 Restaurants were competing for dollars and some even had employees dressed up as characters. 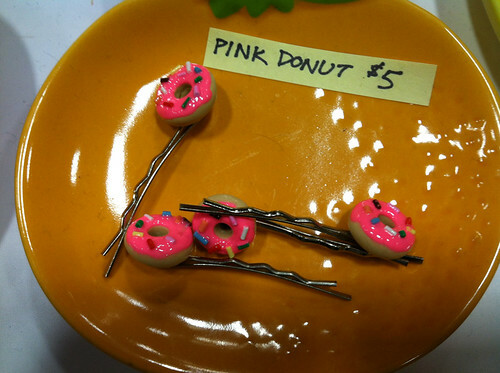 Even Donut Bar got into the act. 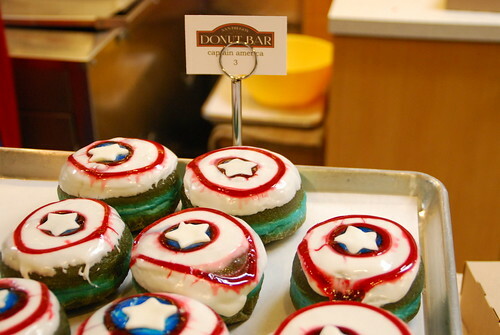 I helped them come up with a few ideas for comic-con-themed donuts and from there it was all them. Among my qualms about it was spelling Spider-Man without the hyphen (a major peeve among comic folks) and using a banana-flavored frosting on their Wolverine donut. Wolverine is from Canada. I think he deserves a maple donut to go with his alternate brown and ochre costume. Yet again, you didn’t have to go far to get free food. 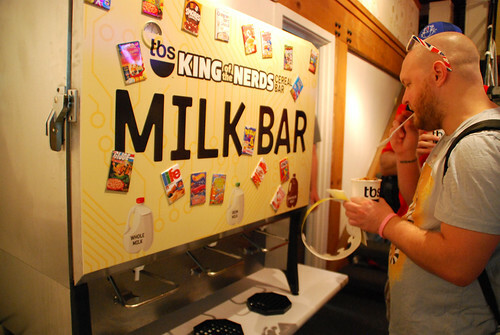 In conjunction with the TBS show King of the Nerds, a cereal bar took root in an art gallery and offered choices of more than 30 cereals, 20 toppings and four kinds of milk between 8 a.m. and 4 p.m. An ice cream truck was also seen giving out a choice of ice cream bars for Insidious 2 and free pizza for Animation Dominination. In the opposite direction of free, I couldn’t help but shake my head at the Carl’s Jr. food truck at comic-con’s interactive zone by Petco Park. Combo meals were going as high as $10! 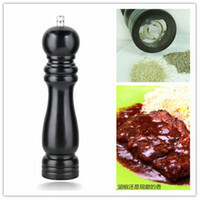 It’s a ridicious price just for fast food. 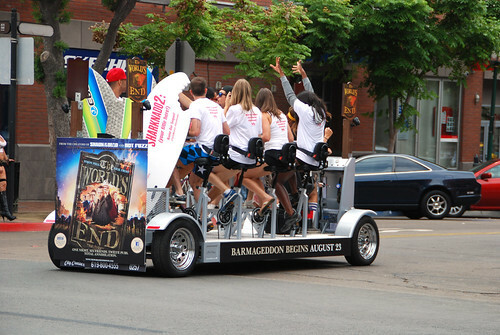 Walking around Gaslamp, I would also catch these unique, multi-seated bicycles promoting Edgar Wright’s new film, The World’s End. As I mentioned earlier, the costumes were largely unimpressive. 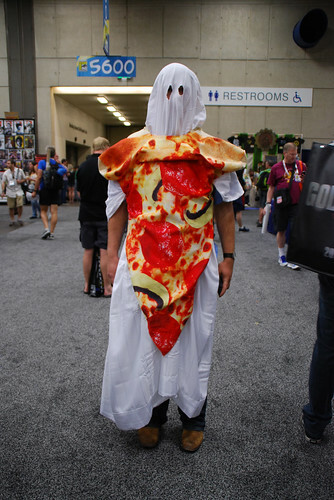 There was a multitude of zombies and costumed folks but the one head-scratcher was this guy dressed as a pizza ghost. It seemed like a half-hearted attempt on his end but it was unique and memorable to me nonetheless. 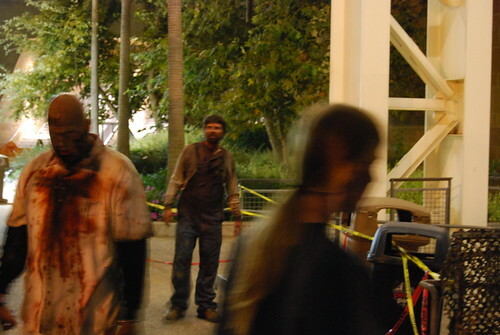 Like all previous San Diego Comic-Con’s — despite the long hours and little sleep — we had a great time. I can’t wait until next year. 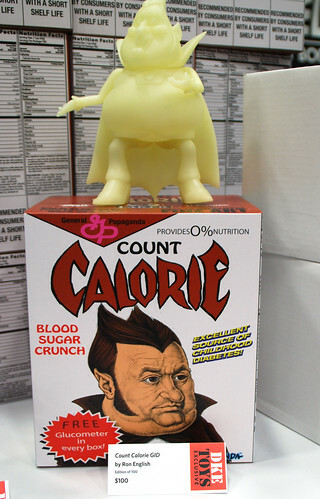 Related: Read last year’s account, San Diego Comic-Con: All Things Related to Food and everything thing comic-related here. I always look forward to your comic-con writeups. You write things other blogs don’t. And it’s funny too. Thanks! It took a while to get this up. Awesome post! I was so happy to see this post up so soon. Looking forward to pix from Paul’s end, especially the costumes. Thanks. Unfortunately, Paul felt the same way about the costumes. Or maybe we’re becoming so jaded that after you see one Batman costume, you’ve seen them all to last a lifetime. Is that a new book I see for next year?? Cool photos. 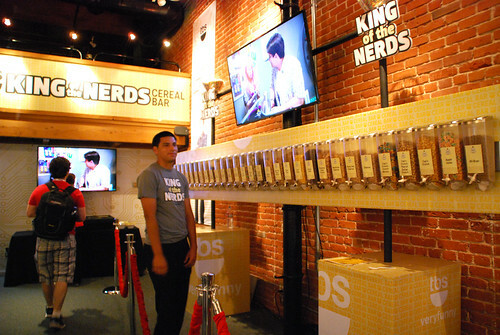 I especially love the free cereal bar. Yes it is! Stay tuned for more news later. Yay! 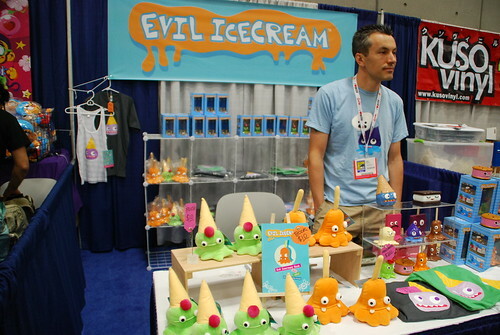 I love your comic-con wrap up about food. I’m not into comics so much but I love these posts. That’s ridiculous about the Carl’s Jr. prices. Why pay that so much for subpar food. Thanks! It’s fun to write about food. 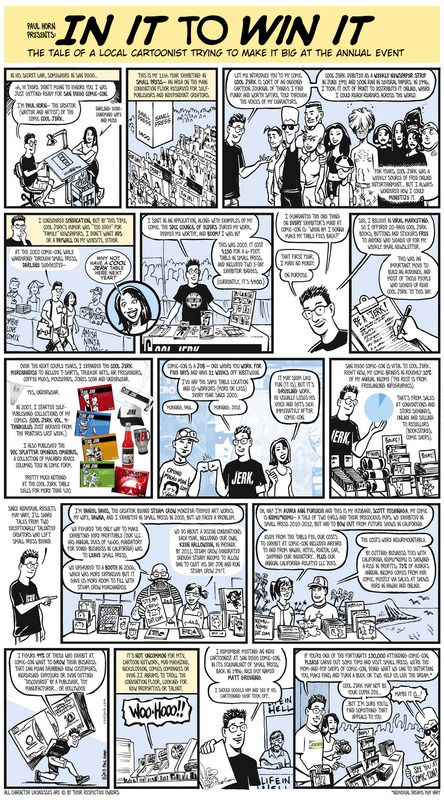 So many other sites write about comics, so I write about food. Yay, awesome write up! I didn’t actually attend the Con, but I did wander around Downtown a bit. I like those ice cube trays. I have a couple of Star Wars ones but I really need to expand my collection further. Pizza ghost dude made me laugh. A for effort, buddy. I would have loved pork belly. 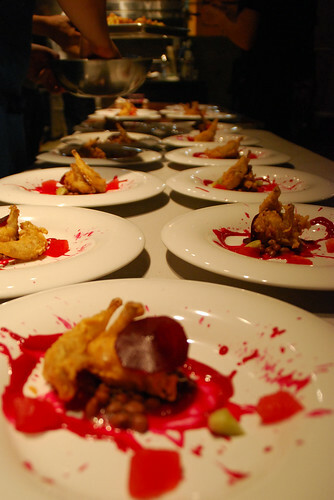 The quail was delicious but it was hard to eat around those tiny, TINY bones. Yikes, it’s a small, but tasty bird. Nice round-up! I haven’t even started to go through the photos we took and I feel like this year my recovery took way longer. I didn’t start to feel normal until about Wednesday. I’m sorry we didn’t get a chance to stop by your booth like past years. We normally reserve Sat and Sunday for roaming the exhibit floor but we got sucked into other activities and lines and barely had a chance to see anything in the exhibit hall, other than what we saw preview night. 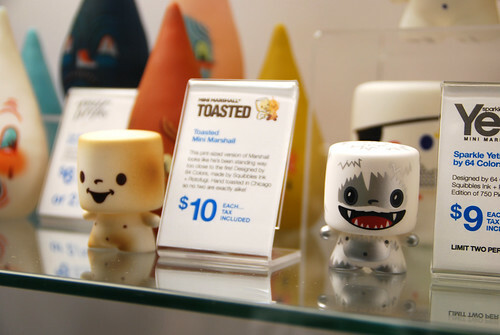 Funny, a lot of your photos were of items I was staring at preview night like the baking shirt and the android cube tray. No worries about not stopping by. And I agree that this year’s convention was massive. We saw people and it only seemed to be only once for many because of the sheer size. Hope you enjoyed and now fully recovered. 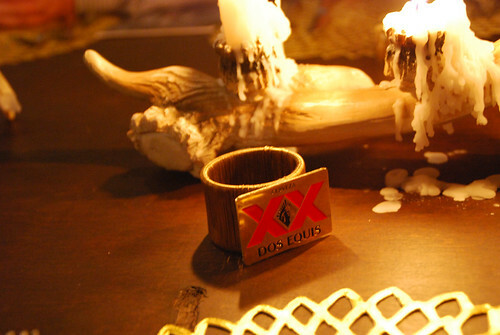 Awesome roundup. I hope I can go next year. I didn’t get tickets. Aw… I’m sad to hear that. Good luck with tix next year. Aw, man. 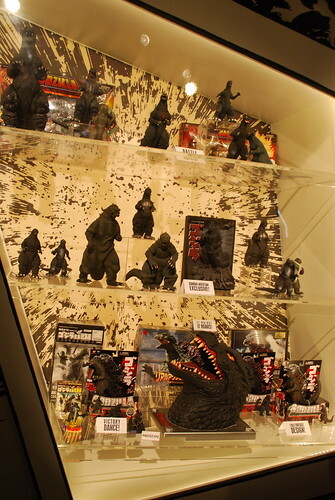 I missed Gojira! I miss you too! If you come back to San Diego, we can go on a donut binge!